Keenum posted a strong total QBR of 89.4 in a win Thursday. But overall the ex-Viking is near the bottom of the NFL in that metric. *This week’s slate of NFL games gives us another reason to examine the four-team QB carousel that took place during free agency. The Vikings signed Kirk Cousins, who took less money than he would have received from the Jets (leaving some in New York with some hurt feelings). The Jets signed ex-Viking Teddy Bridgewater in the offseason but traded him to New Orleans in the preseason to pave the way for rookie Sam Darnold to start. Darnold has shown promise for the 3-3 Jets, who host Cousins and the 3-2-1 Vikings on Sunday. The Broncos and Cardinals also wanted Cousins, but both settled instead for the other two ex-Viking free agents. The Cardinals got the worst of things, paying Sam Bradford $15 million guaranteed this season only to bench him quickly and demote him to third string so they don’t have to pay him weekly bonuses. 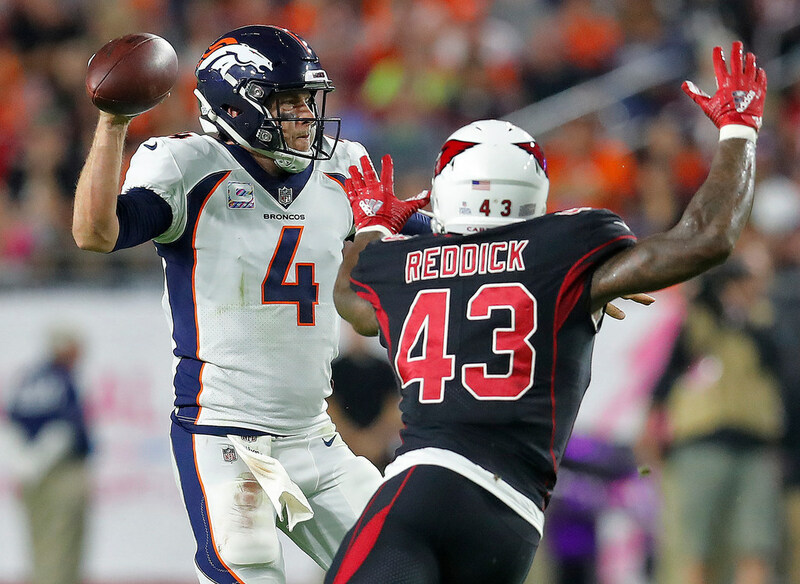 The Broncos took Case Keenum as a stopgap, and it’s been a mixed bag of results so far. Case Keenum, who was exceptional filling in as the Vikings’ starting QB for most of last season and guided Minnesota to the NFC title game, was booed by the home fans last Sunday in a loss to the Rams, but fans are presumably happier after Keenum directed a 45-10 road victory over the hapless Cardinals on Thursday night. Keenum posted a strong total QBR of 89.4, by far his best of the season, in the win. But overall he’s near the bottom of the NFL among starting QBs in that metric. He’s also thrown at least one INT in each of his seven starts (and stands as of now with 8 TDs and 9 INTs) and left Denver fans thirsty for new guy Chad Kelly. Overall, I’d say of the four teams: The Vikings made the right choice and are getting what they paid for in Cousins; the Jets landed in a good spot; the Broncos are getting a back-to-earth performance from Keenum; and the Cardinals are taking their lumps with rookie Josh Rosen after reaching for Bradford. One more thing: Bradford set an NFL completion percentage record in 2016; Keenum had a career year in 2017; Cousins is on his way to a career year this season. All three had Adam Thielen and Stefon Diggs as their primary receivers, adding more evidence of the elite status of those wideouts. *Possible future Wolves watch: Josh Richardson had 28 points and ALSO played defense for the Heat in a 113-112 victory over Washington on Thursday. Richardson remains the most likely centerpiece of a Jimmy Butler trade involving the Heat, which is not happening right now but still could happen if we read the Pat Riley tea leaves correctly. *The Red Sox, who won the World Series 100 years ago, are back in it again after defeating the Astros in the ALCS. Slight difference in how long the seasons are now compared to then: When Boston defeated the Cubs in six games in 1918, the clincher was on Sept. 11. This year’s World Series wouldn’t end until Halloween if it goes seven games. Also: The Game 6 World Series win in 1918 took 1 hour, 46 minutes. Game 4 of the ALCS against Houston took 4 hours, 33 minutes. Both were nine-inning games.